The Health Department Laboratory, is accredited by NELAP, and tests samples for public water systems and individual well waters intended for human consumption. These samples must be submitted in sterile treated bottles supplied by the Sweetwater-Nolan County Health Department, The Health Department provides testing services at the Health Department located at 301 E. 12th St.
Water samples are accepted from 8 a.m. to 3:30 p.m., Monday through Thursday. Please call before holidays, to check hours. 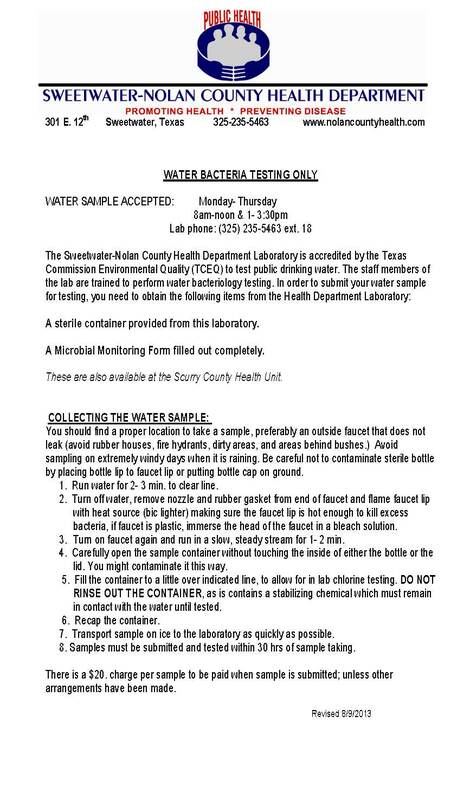 Sterile sample bottles can be picked up from Sweetwater-Nolan County Health Department or Scurry County Health Department. Water samples are not accepted on Fridays, Saturdays, Sundays, or holidays. Samples more than 30 hours old when received will not be tested. We do not accept water samples by mail. The fee for water testing is $20 per bottle. Payment is due at time of service. Information for sample collection is available at the Sweetwater-Nolan County Water Lab located at 301 E. 12th St. in Sweetwater. For information on Pubic Water or well water testing call 325-235-5463 Ext. 1005.